On Sunday 17th February IPSC activists and supporters held a vigil to commemorate the Palestinian village of Quisarya which was ethnically cleansed by Zionist forces on February 15th 1948. 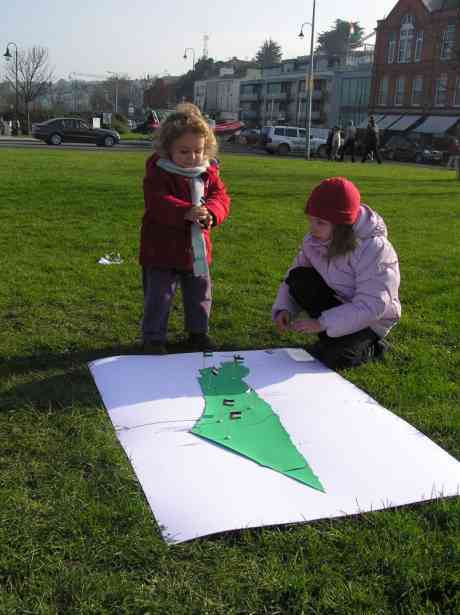 A map of historic Palestine was erected on the green at Howth Quays and members of the public were encouraged to place Palestinian flags in remembrance of the Nakba and symbolically returning the refugees to their lands. Leaflets and wallet cards calling on Michael Woods TD (Chairman of Oireachtas Committee on Foreign Affairs) to support the implementation of UN Resolution 194 which give Palestinian refugees the right to return to their homeland. The IPSC would like to thank all those who took the time to remember the Nakba. 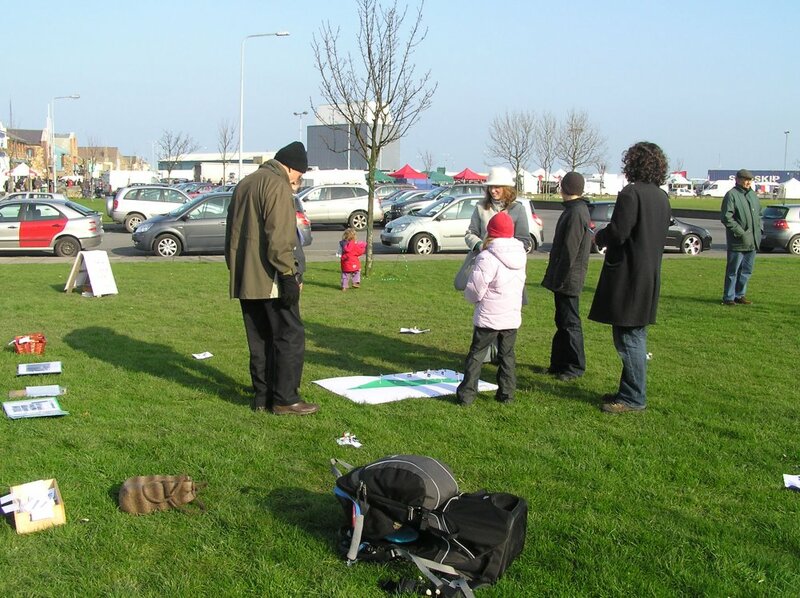 The 2008 Nakba Campaign organisers would like to thank all of the Howth residents & market goers who stopped to place a flag and symbolically return the Palestinian refugees of the 1948 Nakba to their homes, as required under United Nations Resolution 194, last Sunday. We hope that discussion of the events of 1948 will lead to the enactment of international law in the region, and create a real possibility for peace. 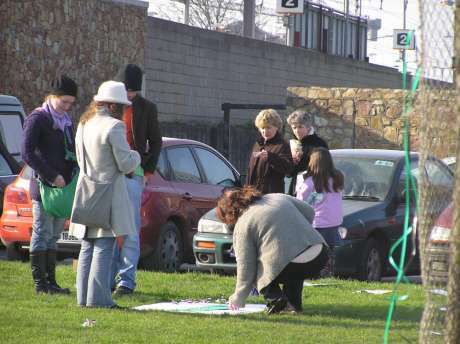 The first person to place a flag on the map was a tourist going to the market, it transpired that her family were Palestinian and she was very pleased to see the occasion marked. The date commemorated Qisarya, the first town to be completely expelled, on the 15th February 1948, a day when four other villages in the area were also expelled. Their mosque was converted into a restaurant. They are not allowed return. In 1948 700,000 Palestinians were driven from their homes, civilians were massacred & hundreds of Palestinian villages deliberately destroyed, this expulsion continues today. 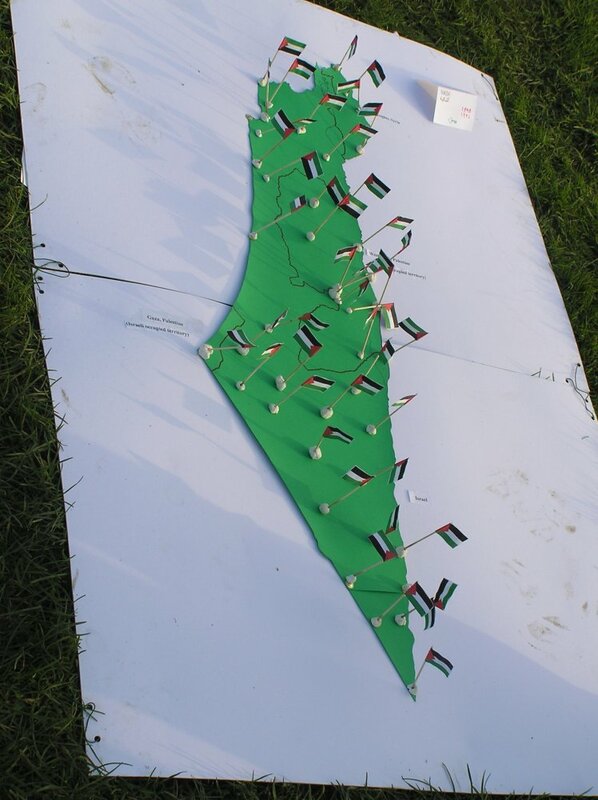 The map shows that the IPSC clearly believe in a single state solution - a Palestinian State without an Israeli state to be seen. If you look at the map you will see that borders are clearly outlined. The flags mark the Palestinian villages which were Ethnically Cleansed by the Israelis. Pat's right - the IPSC don't take a position on the one-state or two-state solution, figuring that this is something for the Palestinian people themselve to negotiate. It's not for us to impose our ideas on them. As for the position of the flags, I'm not making any huge claims for geographic accuracy! They were put all over the map by passers-by to symbolise the various towns and villages all over Palestine that were ethnically cleansed - in 1948, 1967 and now. In fact, considering that there were 500 or so places ethnically cleansed in 1948, the map would be totally crammed with flags, if we'd gone for total accuracy. In reality those who insist on the right of return for all refuges and their descendants to Israel proper are effectively calling for the dissolution of the State of Israel in any recognizable form. It’s just doing it in a more sleight of hand manner. 15. Requests the Secretary-General to provide the necessary staff and facilities and to make appropriate arrangements to provide the necessary funds required in carrying out the terms of the present resolution. 194 (III) is a General Assembly Resolution which is not the same thing as international law and would depend for implementation on final status negotiation. Besides it says refugees should be “allowed to return” rather than conferring a right of return as such and in any event there have been many substantial material changes in the situation in the past 60 years – it is doubtful if is to be taken to mean that all generations of descendants of the original refuges were envisaged within its scope. There is also the issue of reciprocal rights for Jewish and other refugees from Arab states and their position. At the very last stage in the Oslo process Arafat threw this grenade into the whole works knowing full well that it would not only prevent agreement but scupper the whole process and lead to a reversal of the entire Oslo process so painstakingly put together by many eminent parties since Madrid her over years and with the close and personal involvement of the US Presidents. If the maximalist demand is pressed, as with Hamas, there will always be deadlock and tension as Israel cannot negotiate itself out of existence for something that has no precedent in any refugee migration in recent times and there have been many involving millions expelled from the eastern German lands after the second world war for instance. An even-handed approach to the issue recognizes this. However this is not what we have from either Hamas or the IPSC. The IPSC follows a stridently anti Israeli position – not that of a sympathetic bystander concerned about injustice. Is it a Woollworths pic and mix ? What about 181 saying there should be an Arab and a Jewish State ? It's great that this article has attracted so many aspiring lawyers. Besides the UN resolutions, there is the declaration of Human Rights, the rights all refugees have to return to their homes. Frankly, there's a barrow load of international law, all of which Israel is ignoring. Remember, this isn't about the rights of a racist state to continue to be racist - it is about the human rights of these millions of refugees. Can those defenders of Israel not spare even an iota of common human sympathy for them. Firstly, the resolution would not get anywhere near legislation status as US would veto it. Also, vetoed resolutions are not only vetoed from international law, they are, in effect, vetoed from the official memory or official current reference as the act of the veto effectively deletes it from the current process. The resolution is, thereafter, cast down among resolutions that ‘never made it’ and can never carry the weight of agreed upon international law. Speaking from a personal viewpoint, if you want to talk about negotiations, it is obvious that it will not be acceptable to the Zionists/Israelis to have every single person claming descendancy to return to Palestine. Agreeable demographic levels must be worked out during extensive negotiations that are crucially both equitable and free from impedence. All parties are aware of that, despite of all parties stated positions. This is the same in every negotiated political settlement; two groups with disparate views meet and hopefully reach agreeable conclusions. The fact that a party has a specific ideal does not mean that one side can say that, because the other has a specific ideal or goal, we will not deal with them. Also, it does not mean that because of a seemingly entrenched position, one side should do everything in their power to weaken such a side to the point where their hand will be forced to accept what we decide to offer. In order for any negiotated settlement to work over the long term, there should an approach where both sides can feel that they have, and be seen to, make concessions in certain areas and retain positions in others. All parties must have bargaining positions and must in position to have these recognised as they bring them to the table. An even handed approach I’m sure you’ll agree. The point is that the refugees issue is a very important one that is never really considered in any peace talk or proposals. The less thorny issues are dealt with and vague references with no timeframes are sketched in about the crucially important issues. Obviously baby steps must be taken the start but this should be regarded as the beginning, not touted as ‘an agreement’ that, in reality, represents progress for only one side. I posted the Resolution text because there is a concerted effort by certain parties to erase the Nakba ethnic cleansing from record. The ridiculousness of the below article in Haaretz is only juxtaposed by the disgusting, methodical events of the Nakba. What happened to "The bride is beautiful but she is married to another man"? You refer to “maximalist demands” as if the stated position of the US has not changed since Oslo and the Clinton years. It’s plainly obvious that Bush has rowed back on the some of the (even then inadequate) positions that Clinton was willing to push. - Clinton spoke of Palestinian refugees finding homes in other states including Israel, at the Aquba summit, Bush stated that Palestinian refugees should be settled in a future Palestinian state "rather than Israel." Where is the “even handed” nature that you feel is so important in this? This is another example of the US/Zionist-Israeli arrogance in that the US/Israel feel that they can do anything they want, act aggressively militarily, diplomatically, economically etc but when threats rise and counter such aggression, the US/Israel holds up it’s hands in a gesture of innocence (unbelievably), and says ‘look at what these guys are doing, that’s wrong’. The hypocrisy is defies belief. The US talk to insurgents in Iraq (in fact they call them ‘insurgents’, not ‘terrorists’ because they know they will have to talk to them officially at some stage). They talk to the Taliban. They talk to what they class as ‘terrorists’ in other conflicts but Palestine is only area where they say they do not talk to terrorists. The hypocrisy is again obvious. Why do they do all this? Because they are pursuing a policy of aggressionist expansion coupled with a consolidation of power in many forms all over the West Bank and Gaza. A peace settlement does not appear to be part of their agenda in any way, shape or form. That is most unfortunate for all the people of the region. Anyway, I’ve written too much as it is. Firstly the 1948 war launched against Israel was itself a breach of a UNGA resolution. The US does engage with Fatah who are former terrorists but did not do so whilst they were still engaging in terrorism. This is an important matter of principle. The US would engage with Hamas but for failure to disavow terrorism or attacks on Israel from Gaza and the failure even to recognize the right of Israel to exist. What one had with Iraq was the discovery by the former Sunni terrorists that they had a common interest with the US in crushing Al Qaeda in Iraq. The US does not talk to the Taliban. The present problems flow from Hamas, which is not just now an interlocutor with which business can be done. Hamas is not really interested in peace but doing the bidding of Damascus and Tehran in keeping the pot of instability and violence well stirred in Gaza with no shortage of cheerleaders in the west, not least in Galway, to propagandise on their behalf with a veneer of humanitarian concern of course. The position among the Palestinians mirrors that in man other Arab States where there is tension if not open war between the secular faction and the Islamists. Indeed the Palestinians are lucky that Israel is physically in between the main protagonists – otherwise there would very bloody be all out civil war. Of course there must be significant Israeli concessions, especially on settlements and on territory. Of course there are unreasonable elements within Israel too but they need not veto all progress so long as there is an appearance of moderation on the other side and a diminution of the violence. Of course a gradualist approach is the way to go. But where is any sign of reasonableness on the part of Hamas? They seem to prefer extremism and violence to any real effort to develop a civil society that might educate the children of Palestine and not make them militants and suicide bombers. The current US administration has given much time effort energy and resources to finding a solution with numerous summits and an ongoing process. Demonization and the imputation of bad faith to the US and the rest of the international community is unhelpful – the US has partners in its approach including Egypt, Jordan and occasionally Saudi Arabia. The Palestinian side scuppered Oslo and another generation of young Palestinians was lost. For what – they are not going to do better or much better anyway than what was an offer then. Nor can they destroy Israel – only Tehran can do that if they get nuclear weapons. This country developed itself and modernized when it stopped obsessing about partition and ancient grievances, settled for what we had and made the best of it with EU membership and economic and social development. There might be some parallel there for the Palestinians. Any reader of these boards can see that the forces of darkness, extremism, violence and backward looking grievance nursing still exist in Ireland but thankfully there are in a small minority. Today’s Bebo generation by and large is concerned with making the most of life of life’s rich opportunities. 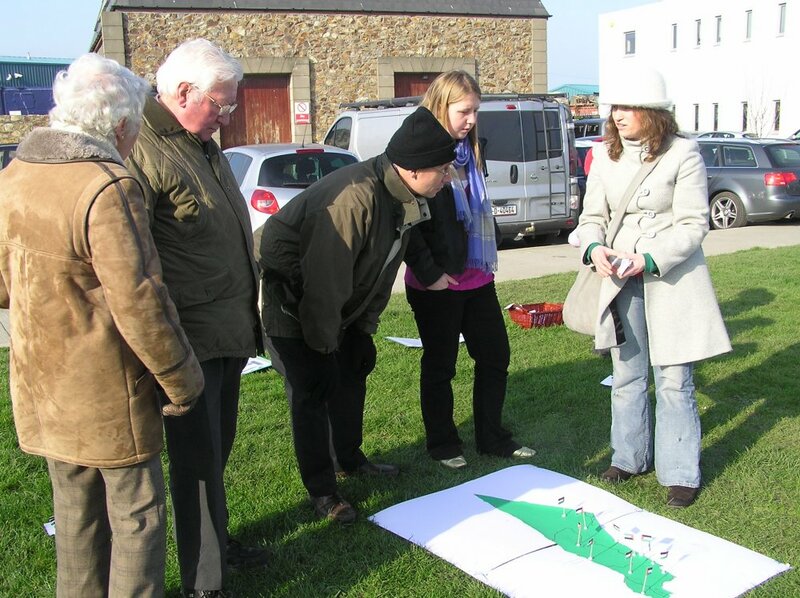 They are not concerned with the latest graveside oration on the evils of partition from Ruri O’Bradaigh. Even American officials who were arranging scholarships for bright Palestinian students have been subject to terrorism. That is nihilism indeed. You talk about the US forces co-opting Sunni terrorists in Iraq as if it was the most natural thing in the world. The US has no right to be in Iraq. They committed what the Nuremberg Charter calls the ‘supreme international crime of aggression’ by invading Iraq, justifying this travesty with false and malleable excuses. The “Sunni terrorists” attempting to stop Al Qaeda in Iraq didn’t exist before the US invaded. There was a brutal Sunni dictator there to keep Al Qaeda out or at least limit their activities. There was no love between Al Qaeda and Hussein. What the US is doing is using the people of the region against those who would seek to either protect their homeland from invaders or those who use every opportunity to attack Americans. It reduces their own body count and limits the bad press. Any commentators who view certain US actions favourably would do well not to invoke the increasing US debacle in Iraq; it is synonymous with catastrophic failure. Regarding recognizing the right of Israel to exist – the insistence by Israel for that pre-condition is be nothing but a deliberate stumbling block, designed to frustrate inception of any such negotiation process. Political parties don’t recognise states, states recognise states. The very act of accepting a negotiation process tacitly admits the existence the other side, but any process looks unlikely to happen if Israel insists on what amounts to nothing but a humiliating first-submission by the Palestinian side before the process can even begin. The rise of Hamas is partly a US creation. By not insisting on a reduction in corruption and blindly throwing money at the more corrupt elements of Fatah, they created the dissention so desired by occupying forces. The election of Hamas, had very little to do with, as the West may believe, the sudden realisation that the Koran was the standard to live by and that the entire country would be better off were it living under Islamic law. Instead, as part of a Western-led programme to hold free and fair elections, it was a response to a desire for government that campaigned on the provision of education and medical facilities for the people, among other things. A fresh government that said it would focus on the people and not turn a blind eye to siphoning of funds by senior party members. Of course it goes without saying that some of the actions of Hamas are wrong. What leads a people to elect an extreme party? The fact that you say that the Palestinians are lucky to be subject to the tyranny of murder, starvation, and theft that the occupation inflicts on the people daily just shows how skewed your view of the matter is. How can that be a good thing? What sort of attitude is “Well, if we don’t kill them, they kill themselves”. The historical fact remains that there is nearly always a civil war in a country AFTER the occupying force has realised they should not be there and go home. However, what appears to be happening in Palestine is that Zionists/Israel/US are using the divide-and-conquer tactic by playing both sides off each other and as that happens, using the opportunity to increase both their grip on the country and the destruction of the Palestinian society. You talk about a “Real effort to develop a civil society” - how in the name of god can anybody develop a civil society with no fuel, power, medical facilities, food, agriculture, industry, leaving the entire area practically cut off from the outside world. Extremely limited access to the above items results in major shortages that affect the entire population. This short-sighted action only creates future hostility that later generations on all sides will have to deal with. I’m guessing the Bebo generation wouldn’t be too keen on being stuck in Gaza. “US administration has given much time effort energy and resources to finding a solution”. They have not to done so unfortunately. Much time, effort and resources have gone into the whole process but the end goal would not appear to “find a solution”. Settlement building is continuing (Har Homa for example), house demolitions are continuing. As George Bush was on his last PR trip (first in the region after years in office), the attacks on Palestinians did not even cease. If you were to play a recording of the sound of the attacks and subsequent screams, as the president spoke during one of the press conferences, they would cease to be such jolly affairs. How can aggressively pushing your position by adding to the problem (e.g. settlements etc) be viewed as “finding a solution”? Why you think that it’s a good thing that today’s younger/bebo generation are only focused on themselves and certain elements of “life’s riches” is beyond me. Hopefully such a focus is only a veneer.